Very few interventions or career days have the advantage of practically illustrating what a career is all about. 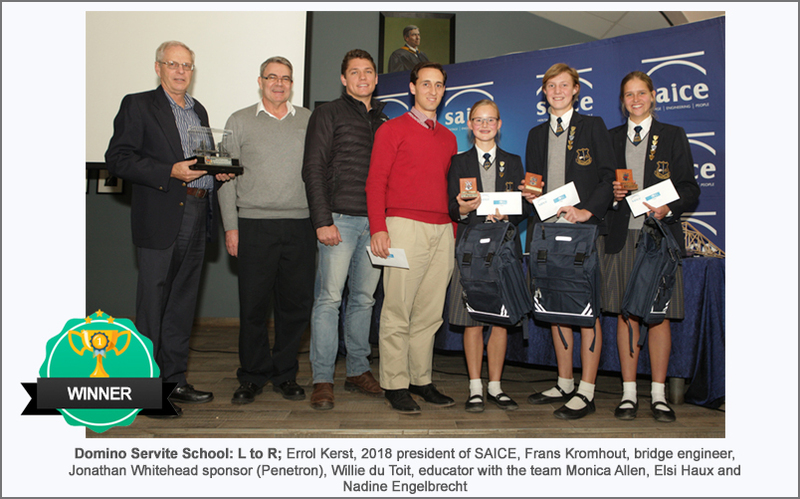 The finals of the very successful annual SAICE International Bridge Building Competition 2018, organised by the South African Institution of Civil Engineering (SAICE), provide learners with this opportunity. The finals will be held on Friday 31 August 2018 at the St Albans College in Pretoria. The winners of the regional competitions from across South Africa, Swaziland and Zimbabwe will be participating for the prestigious ‘Bridge trophy’, as well the prize-money. These competitions are organised by the SAICE branches. 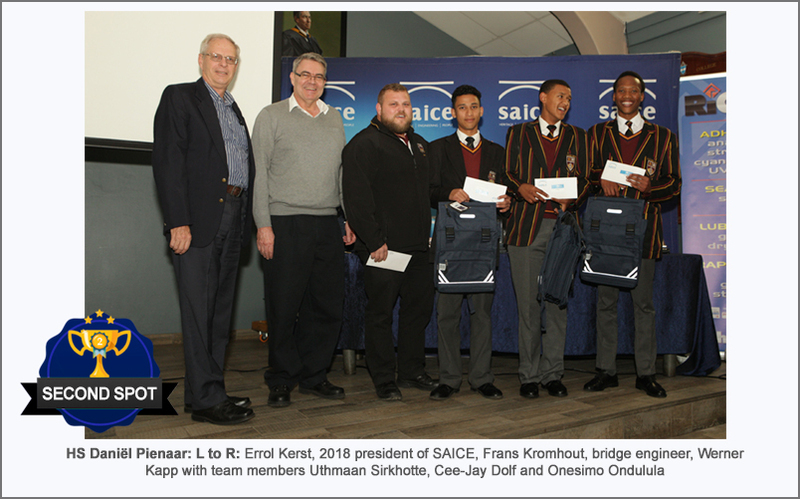 Last year the winning team from Kimberley Technical High School constructed a bridge carrying a weight of 324 kg and weighing 263 g! 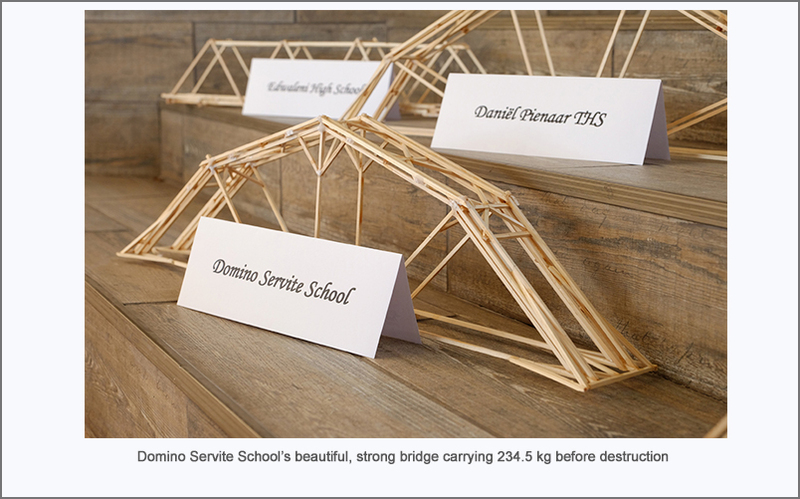 Second was the Domino Servite School from Kranskop near Pietermaritzburg with their bridge that withstood 241.8 kg before breaking. In third spot was HTS Daniël Pienaar from Uitenhage with a bridge carrying 233.6 kg before breaking – exciting stuff! Approximately 650 schools from across South Africa, Swaziland and Zimbabwe were reached in 2017 to determine who the finalists would be in this exciting competition, now in its 27th year. During the finals, seeing is believing, when you observe the teams building bridges from dowel sticks, glue and a bit of string, and then carrying weights of more than 230 kg! Although there can only be one winner, all the learners benefit by participating and being in a big city. Many learners even experience a first time flying in an aeroplane – never to be forgotten! Getting to meet other people and learners from all corners of South Africa, as well as from Swaziland and Zimbabwe, provides an added advantage, all of which are made possible through the generosity of the sponsors. Should you want to be part of this amazing adventure, PLEASE call us as we need your support to make it possible! An informative presentation by a civil (bridge) engineer on the stresses and strains peculiar to bridges, to be taken into account when designing a bridge, precedes the action. Each team consists of three learners from Grades 9 to 12. The bridge building kits contain 25 dowel sticks of 3mm nominal thickness, glue and a piece of string. Construction is done according to a technical briefing given on the day. The teams then get down to the gruelling business of planning, designing, measuring, cutting dowel sticks and constructing the bridge by gluing everything together to construct sturdy bridge structures, while racing against the clock towards tools-down time! Then it is tools down, and the meticulously constructed bridges are left to dry. Once ready, the adjudicators complete their task regarding bridge aesthetics and mass. The teams, after having exchanged daytime T-shirts and tracksuits for school uniforms, gather in the auditorium for an evening of nerve-wracking testing of their bridges. Each and every bridge is tested to destruction to ascertain its weight-bearing capability. Ultimately, aspects such as aesthetics, the mass of the bridge and the weight-bearing capacity determine the winning bridge! 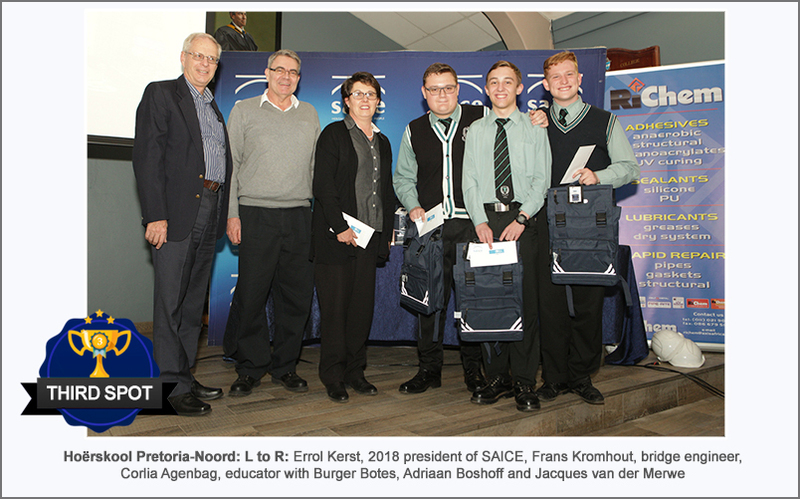 The South African Institution of Civil Engineering (SAICE) initiated this competition in 1991 to further high school learners’ use of Mathematics and Physical Science to grow the profession. It has since become an enormous success. 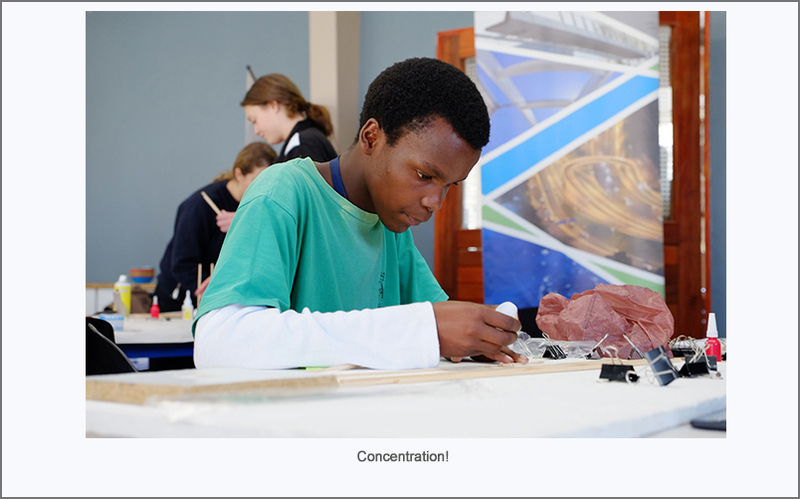 The bridge building competition forms an integral part of some schools’ activities and is recognised on the same level as academic or sports achievements. Because of its practical and hands-on nature, this event is SAICE’s most successful initiative in attracting learners to civil engineering, as well as promoting a general awareness of the profession. The importance of Maths and Science is emphasised throughout. The competition provides an ideal career guidance opportunity. 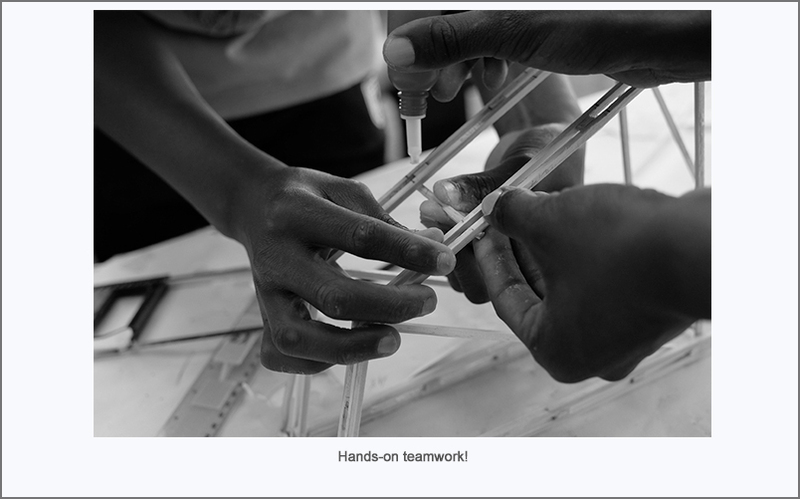 It gives learners the opportunity to also build bridges between people, cultures and countries! 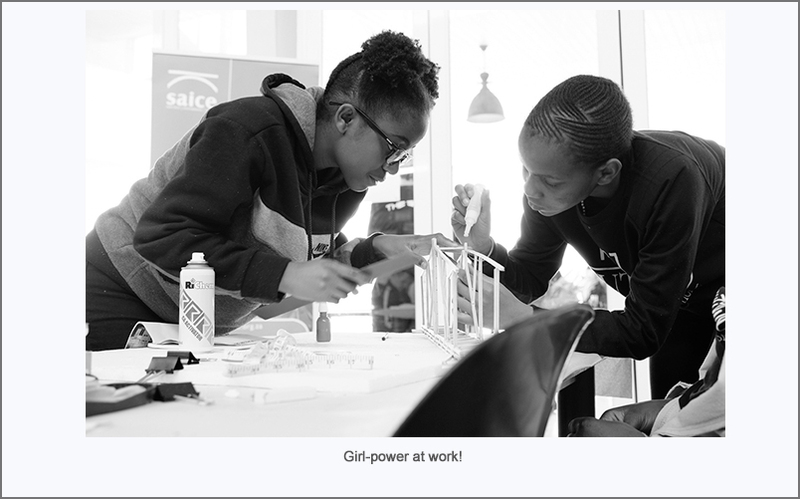 This initiative, in support of government’s objective to address the priority scarce skills situation in South Africa and with civil engineering as the second scarcest skill on government’s draft list, has captured the imagination of learners since its inception and has led to many choosing civil engineering as a career! to all who made this event possible – participants, educators, branch administrators, regional organisers, sponsors, adjudicators, staff at St Alban’s College, parents and SAICE National Office staff.